Part of a large composition from an upper-storey room of the “Villa of the Lilies” at Amnissos. 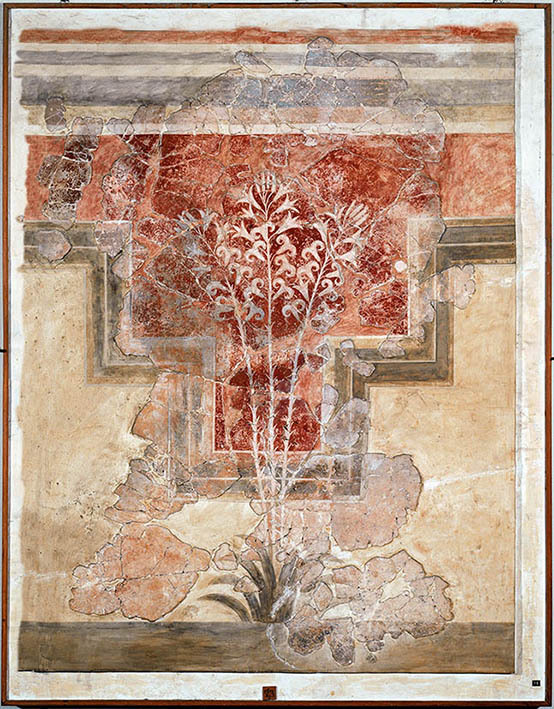 The fresco depicts white lilies against a red ground and red irises against a white ground with long stems blooming symmetrically in front of a stepped fence. The composition, including other plants in flowerbeds, is thought to depict a fenced garden, a place of leisure and pleasure as well as a marker of high social status. It was executed using a combination of both the fresco and the in cavo techniques, the later involving cutting away the fresco surface in places and refilling the grooves with thick pigment.